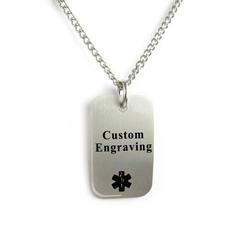 Stainless steel medical id alert dog tag necklace has a black or a white enameled medical symbol and measures 1.5" x 1". This is 316L stainless steel and we engrave in BOLD BLACK laser engraving at no extra charge. We also offer this medical id alert necklace with a white or red symbol! Comes with a 27" stainless chain. 5 Lines on back 22 characters per line including spaces.